DRAGON CHESS has all the moves, extra playing pieces and new layout representing the next evolution of an age-old game! How do you improve one of the world's oldest and most popular games? Just ask Lex Parker (the game designer), which is releasing a new chess game that incorporates a powerful new piece on an expanded board. DRAGON CHESS has the same set of rules as Chess. However, the playing field has 124 squares. There are two Dragons per player, each with a Pawn located on the rank in front of the Dragon. The Dragon occupies the outer two squares on the same rank as the King. The Field has two extra ranks (rows) and files (columns) as well as two flanks each with 12 squares located on either side of the main playing area proving a total playing area of 124 squares. The Dragon moves and captures on the rank (horizontally), file (vertically) and diagonally, over unoccupied squares and limited to three squares in line. 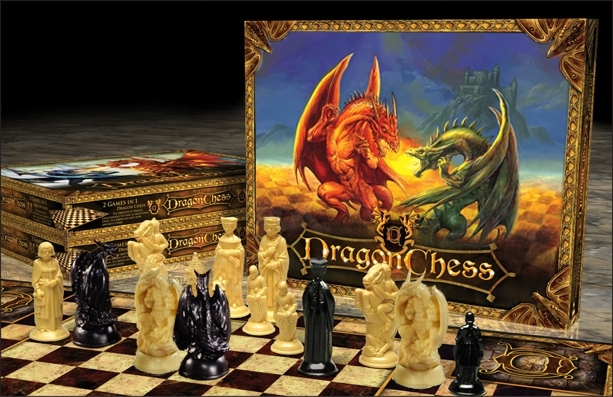 DRAGON CHESS is a fantastic board game with an impressive art design and a top notch production . All Dragon Chess pieces are top quality plastic injection molded . And.....You can still play the traditional chess game on the identified sixty four square center field. Dragon Chess or traditional chess , the choice is yours ! Dragon Chess : the traditional chess game is reborn ! the likelihood of a draw and make the game itself more interesting.